Zoom Rent a Car in Dhaka has become the top trade name in car rental services in Bangladesh. 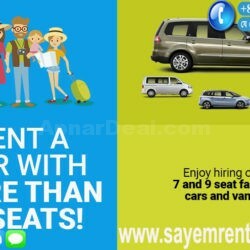 Zoom Rent a Car is popular in Bangladesh for quality service. We make sure a stress-free car rental experience by providing superior services that provide to our customer’s individual needs. Customer satisfaction by providing quality services is our mission. It’s a promise to every customer. The company always desire to keep in touch with the customer.